Local sign warning of Area-179's restricted status. Image taken 4 October 2006. The sign no longer stands. Due to the subterranean nature, self-ambulatory capabilities, and physical properties of SCP-1179, enforcement of containment has to date proven impossible. Project Tartarus is charged with continuous research into developing additional practical containment measures for SCP-1179. It is speculated that SCP-1179 is capable of being destroyed, as wounds inflicted by heavy ordnance during the evacuation attempt of Expedition-1179-VI were later observed to not have healed. To date, isolation and observation of SCP-1179 has mostly proven sufficient, as SCP-1179 has demonstrated no efforts to move above ground and has limited itself to a roughly two kilometer radius from its original location of discovery. In the event that SCP-1179 should be observed to move beyond recorded areas, personnel are to immediately notify O5 Command. A bunker has been constructed in a geologically stable section of Area 179, allowing for Foundation operations in the area and monitoring of SCP-1179. 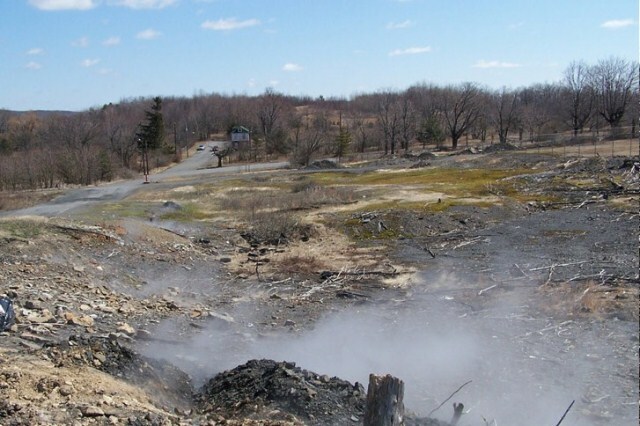 Foundation security personnel, along with local law enforcement, are to coordinate to prevent civilians from entering Area 179, in accordance with warnings issued by the Pennsylvania Department of Environmental Protection. Personnel within Area 179 are to restrict their movement to approved areas, due to the geological instability caused by SCP-1179. SCP-1179 appears to be a giant vaguely humanoid figure carved from an unknown volcanic rock. In one hand, it holds a whip; in the other, a sword. Its face has vaguely human features, including a long beard, though it has two large horns like those of a ram flanking its face. SCP-1179 measures over 30 meters from head to toe, with shoulders over 8 meters wide. It resembles a carving of the Norse eld jötunn Surtr (the giant guarding the frontier of the Norse fire realm of Múspell). Dating of the stratum encasing SCP-1179 indicates it dates to the Mississippian subperiod of the Carboniferous period, approximately 359.2-318.1 million years ago. This age is consistent with the geological age of this region. SCP-1179 has since demonstrated the ability to change shape at will, and to become invisible and without form, appearing as a giant flying shade. Photographic evidence has failed to produce a conclusive image of SCP-1179, due to inexplicable camera feed disruptions, operator panic, and physical destruction of cameras. Expeditionary teams have described SCP-1179 as “having hellfire” for eyes and generally having great height. Its body often is seen as a combination of fire, smoke, and hardening lava. From there, the descriptions begin to diverge wildly. Survivors generally describe its head as “monstrous,” with some mentioning curved horns consistent with the original form of SCP-1179. Others argue it has fangs larger than a man's arm. Still others state that SCP-1179 has neither horns nor fangs, and its face is encircled by flames which reach down into a long beard of fire. Eyewitnesses cannot agree whether or not it has wings. Most agree that it is usually armed with a multi-tailed whip of flame and a glowing red sword of fire several meters in length, though it will at times appear with either the whip or the sword or neither. Though of great size, it is apparently capable of moving both quickly and quietly. Those few who survive encounters with SCP-1179 generally describe it as smelling of “rotten eggs and old chimneys”. Chemical analysis of air samples taken from SCP-1179’s breath have shown exceptionally high concentrations of carbon monoxide and sulfur dioxide. SCP-1179 was discovered in 1871, five years after anthracite coal mining was begun in the area. It was nicknamed the “sleeping stone giant”. The mine shaft in which it was discovered belonged to Mr. Sean O’Malley, a member of the Molly Maguires, an Irish-American secret society, whose members were predominantly coal miners in Pennsylvania. The society kept the sleeping stone giant hidden away, a closely-guarded secret. Though the Molly Maguires were dismantled in the late 1870s, the giant’s guardians managed to escape prosecution. The sleeping stone giant came to the attention of the Foundation in 192█, when operatives were conducting a routine background check into Prospective Agent Iain O’Malley (grandson of the original Mr. O’Malley). The land above the giant’s mine shaft was purchased by a Foundation front company and Research Site-██ was established. In May 1962, residents of the nearby town lit a trash fire in a landfill which had been created from an abandoned coal mine. Those responsible for garbage disposal followed insufficient safety protocols, and a seam of anthracite coal ignited. The seam was small and Foundation geologists have determined it would have burned out in approximately two years, had it not run under Research Site-██. The fire reached SCP-1179, which promptly reanimated in the presence of the fire. Upon reanimation, SCP-1179 killed all Foundation personnel at Research Site-██ and significantly damaged the site’s bunker. It subsequently retreated into the honeycomb of coal mines and caverns in the area, igniting subsequent anthracite coal fires. The mines, caverns, and surrounding countryside was designated Area-179, though due to the nearby town’s civilian population of several thousand individuals, standard Area construction protocols for Keter containment could not be observed; these were modified to fit the circumstance. Five separate Expeditionary Teams were sent in to capture SCP-1179 between 1962 and 1970, though none were successful. They did determine that SCP-1179 had proven capable of expanding the caverns to vast proportions and unknown depths. Satellite imagery and evidence of noxious gases and ground collapse contradict these accounts and the photographic evidence which confirms them, indicating that the mine fires are only burning in an area covering roughly 400 acres, or 1.62 square kilometers. The discrepancy between the sizes of the caverns has, to date, not been reconciled. In 1970, Foundation geologists determined that the subterranean fires caused by SCP-1179 would remain burning for in excess of 250 years. 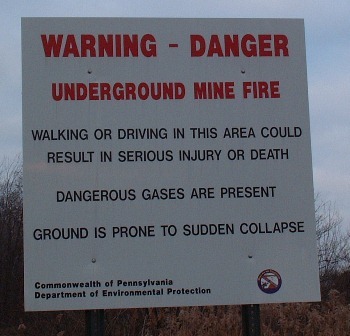 With Foundation personnel successful in perpetuating the half-truth of the original cause of the mine fires and unsuccessful both in recovering SCP-1179 for removal and transfer to an alternate location and extinguishing the blazes it had caused, the decision was made to instead relocate the nearby town. Concurrently, Project Tartarus was formally begun to develop and refine permanent special containment procedures for SCP-1179 and determine means to extinguish the anthracite fires. Foundation personnel have worked constantly in the area to ensure the continuation of the mine fire cover story and prevent civilians from encountering SCP-1179, though this proved increasingly difficult as the local situation continued to deteriorate. In 1981, twelve-year-old local, Tom Domboski, fell into a sinkhole approximately 1.25 meters wide by 46 meters deep which opened beneath his feet his backyard. He was saved by his cousin, 14-year-old Eric Wolfgang. 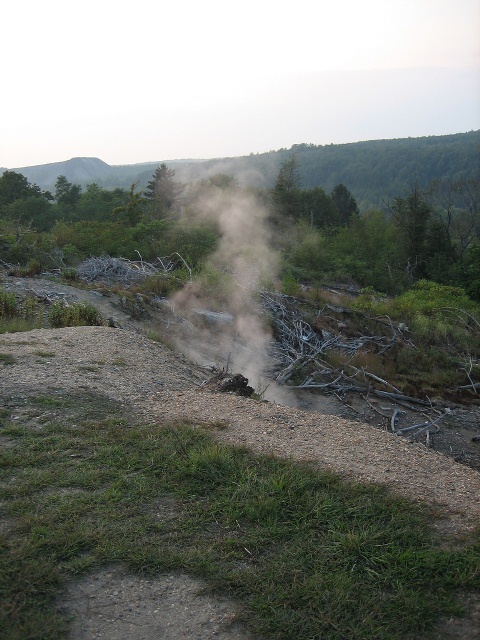 The plume of hot steam billowing from the hole was measured as containing a lethal level of carbon monoxide, and chemical analysis matched the steam to samples of SCP-1179's breath. Spurred both by the worsening “mine fire” and by covert lobbying by Foundation political contacts, in 1984 the United States Congress allocated funds in excess of $42 million to relocate the civilian residents from the area. At the suggestion of under-cover Agent █████, Pennsylvania Governor Bob Casey claimed eminent domain on all properties in the borough, condemning all buildings within. Foundation personnel ensured that the subsequent legal effort by residents to have the decision reversed were met with failure. As a result, full Keter Area containment protocols could finally be observed. Addendum 1179-1: Research is pending into harnessing the anthracite coal fires as a means of energy production, as they will likely continue burning for the foreseeable future. See Project Vulcan’s Forge, or contact Project Lead Dr. Crane or Area-179 Director Wilson for further details. Addendum 1179-2: Images relating to SCP-1179's effects on Area-179. 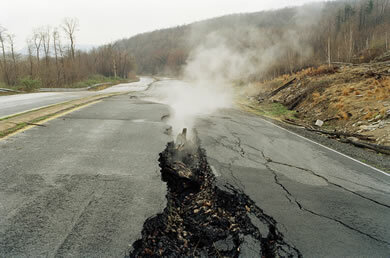 Damage caused by SCP-1179 to former Pennsylvania Route 61. A hillside in Area-179 which has collapsed due to SCP-1179. Noxious gases rising from a sinkhole in Area-179; chemical analysis suggests some of these were the breath of SCP-1179.